Look at what Bin Lin, the co-founder of Xiaomi just shared on his Facebook page: a teaser to the company’s annual product launch event happening on 22 July 2014. 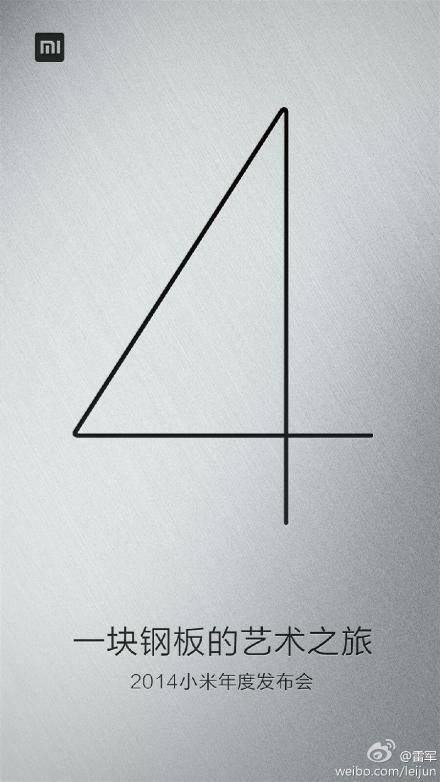 The teaser consists of an image with a big number 4 on it, and accompanying text that says “July 22nd, Xiaomi’s annual product launch event. We will tell the story about “The journey of a piece of steel metal”. Any thoughts?”. Could it be the Mi 4 we’ve been reading about lately? We think so, and it’s going to be as exciting as ever because hopefully, “the journey of a piece of steel metal” means that the Mi 4 could be crafted out of a single piece of metal. The event should be held in Xiaomi’s homeland in Beijing, China, and like all Mi product launches, it will be launched in China first followed by the rest of the world. Let’s keep our fingers crossed we won’t have to wait too long. How many of you can’t wait to see what Xiaomi has got to offer?